The competitive swim squads train at the Waterworld Aquatic Centre, Ridgehaven in Summer and at the ARC Campbelltown in Winter. The Club will always strive to reach each swimmers full potential. 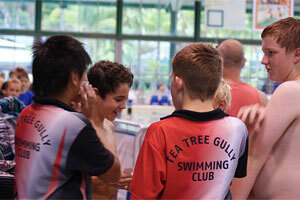 Interaction and transfer between squads will be encouraged and accommodated to suit family and swimmers needs. For further details look below or download the Squad Details here. Venues: Waterworld - Summer | ARC - Winter. 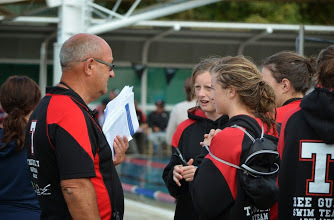 Promotion of swimmers to the State Squad must be at the recommendation of the J1 Squad coach. Fee reductions for reduced sessions may be discussed with the Treasurer. Family discount of 10% for second and subsequent swimmers per family. 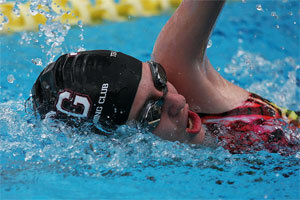 Annual Membership : $110 for 1 swimmer, $190 for 2 swimmers and $250 for 3+ swimmers. Arrive 15 minutes prior to the advertised time for warm up and report to the team manager. Prepare your cap and goggles for warm up, ensuring goggles are a good fit and will not fall off when executing a dive start. Coaches will then take swimmers to a team area for stretches prior to entering the pool. Note: Unless specified, entry into the water during warm up is feet first. DO NOT DIVE IN you will be disqualified from your first event. Your coach will advise you on the best way to swim your race, it is normal to feel nervous. Most swimming meets have marshalling. Marshalling involves swimmers being placed into their heating prior to hitting the pool deck. Make sure you are aware of where the marshalling area is and report to this area at least 2 events before you are required to swim. If a heat allocation board is in use, this is an indicator only. Note: It is your responsibility to be at marshalling on time, failure to report to marshalling on time may result in disqualification. During some meets, ‘Starting Over the Top’ is used. This will be advertised in the program. Swimmers who have completed their race stay in the water holding onto the lane rope until the next race begins. 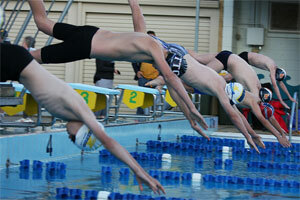 The swimmer on the blocks dives ‘over the top’ of you, then you may move to the side of the pool and exit the water. When backstroke swimmers are starting, swimmers in the previous heat shall move 1m back from the finishing wall and hold on to the lane rope until the start of the next heat has been completed. Swimmers may then leave via the side of the pool. The starting procedure for carnivals etc is exactly the same as for Club time trials. 3. Dive in on the start signal. False starts are signalled by several short blasts of the starting signal. If you are not in the first heat, watch the start process of the earlier heats so that you are familiar with the start signal and start process for the meet. Your coach will advise you to complete a cool down swim after each heat (time permitting), cool downs assist with muscle recuperation after an extreme exertion of energy.